Scheduled Tweets: Reach your followers anytime. Future Auto Tweets. Stay organized with scheduling your tweets. Send status updates to Twitter even when your away from your phone or computer! Future Tweets. 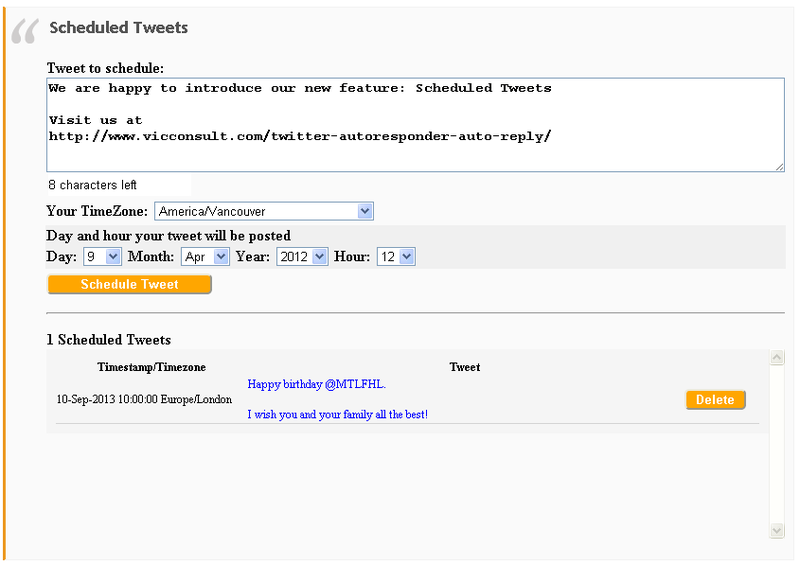 Today (April 8th, 2012) we introduced a new feature to our premium Twitter AutoResponder users - Scheduled Tweets. What is scheduled tweets? It is service that allows Twitter users to send updates automatically at scheduled day and time sometime in a future. If you away, on vacation or simply sleeping, but still want to reach your followers on twitter, scheduled tweets is the right solution for you. If you out of Internet reach and still want to reach your audience and send updates, schedule ahead tweets as many as you need, and our system will deliver them to your followers in a timely manner. Know your followers and reach them when they online. To get best ROI or conversions, tweet when your followers online. If you tweet when your followers asleep, your updates may be never read when they will be back online. Know your followers, know what TimeZone they are, and send update when there is day time, not night. If you have small amount of followers, you can go one by one on Twitter and see what their TimeZone is. But, if you have gained hundreds or thousands followers, gong one by one on Twitter can be BIG job and time consuming. We provide very affordable service to analyse your followers - Twitter Analytics. Our Twitter Analytics tool will extract all your followers details, available on Twitter, including their language and timezone. You will receive Twitter Analytics Excel spreadsheet by email. Most of our followers reside in several time zones in US and Canada, as well as in Europe, and we reside in Eastern Canada. The time difference with most of our followers varies between few hours to 8 hours. If we want to reach most of our European followers, we might schedule status updates between 2am-5am EST, while we are sleeping. And of course Twitter is not only business and marketing. If you want to wish happy birthday to your friends on Twitter, you can schedule the birthday tweets ahead of time, and you never forget. First you must be our premium Twitter AutoResponder user. If you are, you will see the area on our website (see image bellow) where you can schedule your tweets. 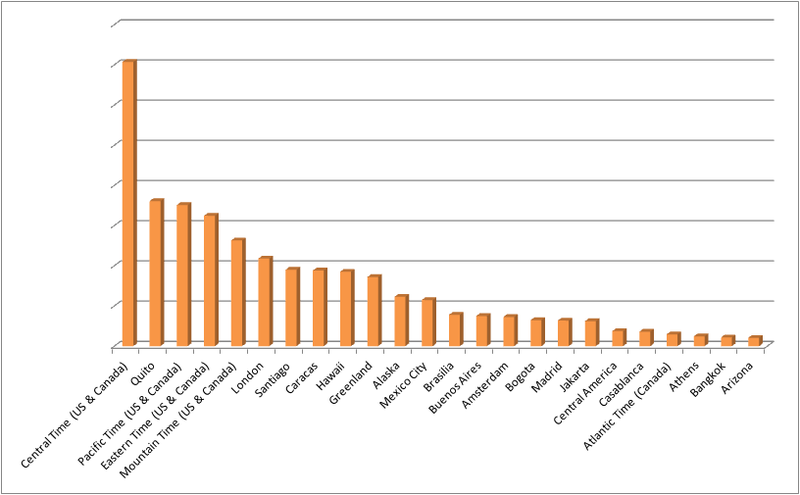 Now, simply write your message, select your timezone or timezone most of your followers are from, select date and hour. And tricky part here - don't forget to click on "Schedule Tweet" button. At the bottom you will see all currently schedule tweets, and you can delete each of them separately.